Kauai is the Northwestern-most of the eight major Hawaiian Islands. It is separated from Oahu, the population center of the Hawaiian Islands, by the wide Ieiewaho Channel. This geographic barrier made for a distinctive culture and history on Kauai, and its character as "a separate kingdom." Within the Island of Kauai, Haena resides in the Halelea district of the North. 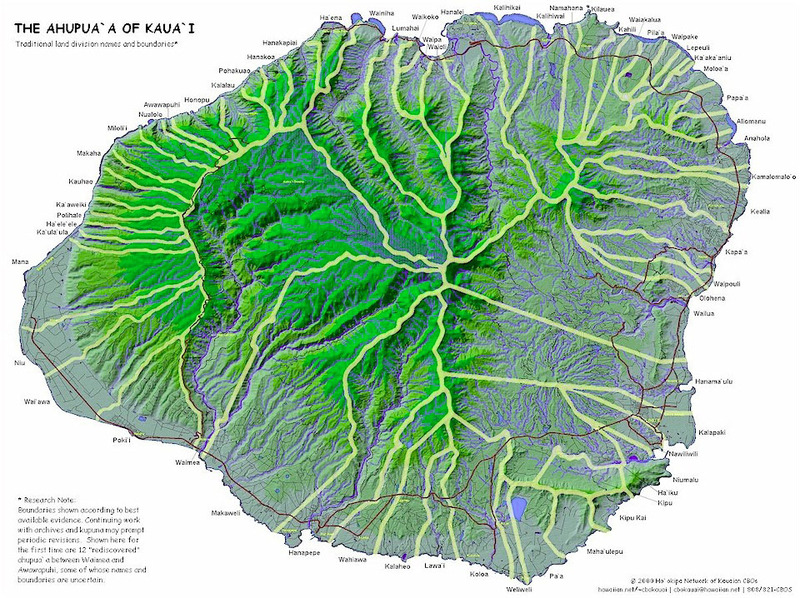 Kauai was divided into five major districts (moku aina) that correspond roughly to contemporary administrative divisions. Haena lies at the Western end of Halelea, where the lowland plain yields to the rugged cliffs of the Na Pali Coast plunging into the sea. Beyond Haena, settlements nestled in secluded valleys are accessible only by windy trails along steep slopes or by boat. Still today, the road ends at Haena. 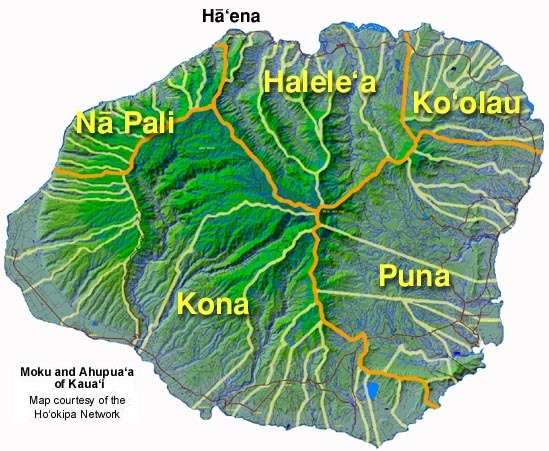 Click Here to view the large-file ahupuaa map of Kauai developed by the Hookipa Network (thanks, Ken and Pua!). It will open in a separate window. 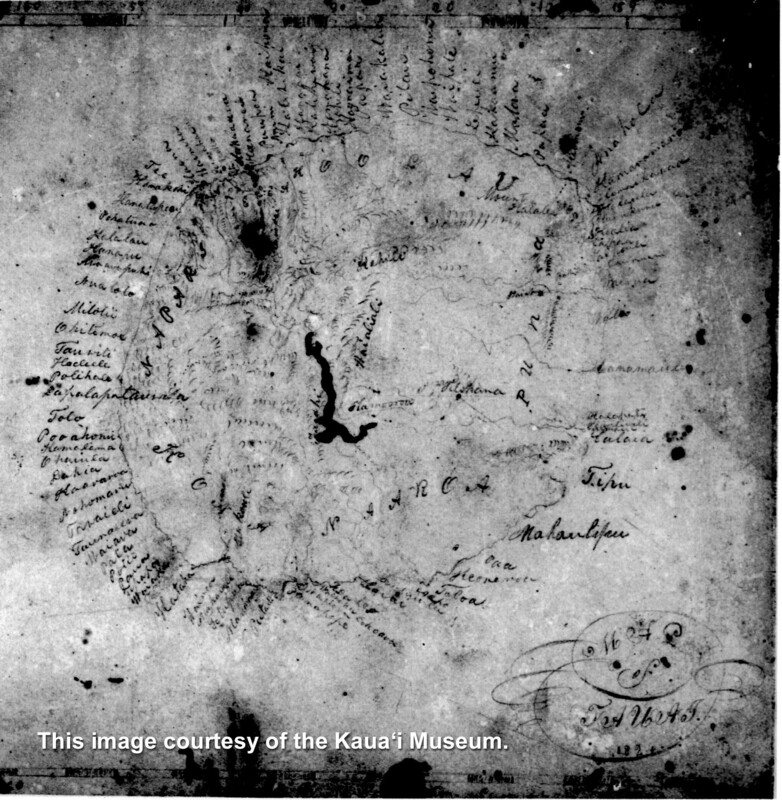 Want to see an 1824 map of Kauai? This one shows the mokuaina and ahupuaa, using T's and R's in the spelling. Map courtesy the Kauai Museum. 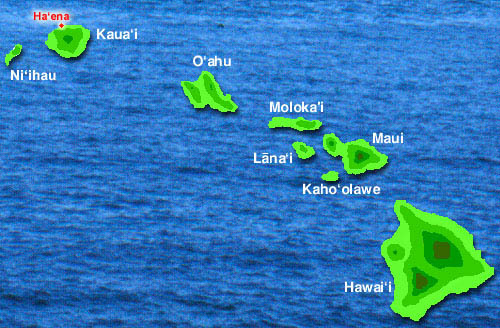 Now that we know where Haena is located, let us get some orientation to this land division.